Promises cooler days and chilly nights. Everyone to settle down for the season. Rise to grow once more in next year’s glory. This is my favorite month of the year and the beginning of my favorite season. Is it yours too? I have been reading so many wonderful blogs about putting up fig jam, preserving fruits and vegetables, getting ready to harvest and getting late summer planting done. The gardeners, too, are talking mums and bulbs! There is so much abundance! So much food to, as they used to say, “put by!” So I thought I’d share my simple recipe for cucumber pickles which only take about three weeks to be ready. In a small pot bring your spring water, vinegar, brown rice syrup and salt to a boil while you clean and quarter your cukes. Pack the cukes in a jar and add the pickling spices and the garlic. When the salt is dissolved in the boiling water, cool the mixture down enough to pour into the jar. You want the cukes to be fully covered with the water so if you need to add more liquid you can pour in some more vinegar. Put the lid on the jar and put it in the refrigerator for about three weeks and . . Voila! . . . you have good ol’ pickles. * Pickling spices can also include things like dried ground ginger, chili pepper flakes, coriander, cinnamon sticks, mace, and cardimom. Dill pickles would of course include dill seeds and dill. You can buy pickling spices already assembled, but beware: If the ingredients don’t list out the individual herbs and spices and just says “spices,” then it may also have chemical additives such as MSG which you probably don’t want. Unfortunately it is legal to include such things in something labeled “spices.” I only use all organic ingredients with no additives in anything I make. 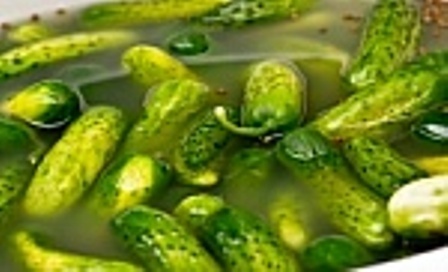 This entry was posted in Cooking, Recipes and tagged autumn, cucumbers, pickling, pickling spices, poetry, preserving food by mycookinglifebypatty. Bookmark the permalink. Ms. Patty, you are incognito! Hoping everything is OK-dokey in your world. Good morning, September! We have been making lots of refrigerator pickles this year–not enough to officially can. Your recipe looks like a keeper! Thanks Kathy! They are so so easy to do and hmmm. . . mine will be ready this week, come to think of it!